May is the perfect time of year to think about filling our lovely window boxes with seasonal plants. Why not take advantage of our window box offer? If we have any stock left, you’ll receive 10% off the painted price for any standard sized wirework window box. 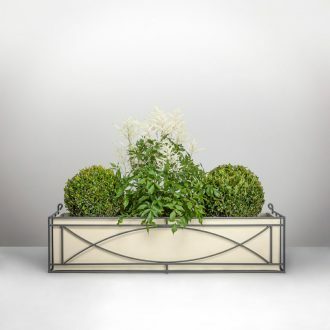 Our crescent window box shown is a timeless classic that will look good on any town or country property. Fill it with terracotta pots or one large planter for maximum capacity. Not sure what to plant? Why not check out our blog or the fabulous displays at the RHS Chelsea Flower Show for seasonal inspiration.